Exam 2019. Available posts are Postal Assistant/Sorting Assistant, Lower Divisional Clerk (LDC), Junior Secretarial Marketing Asst and Data Entry Operator. Selection for these vacancies will be held in three different stages of Tier 1 Online Written Test, Tier 2 Descriptive Type Test and Typing Test or Skill Test. Tier 1 Written Exam will be conducted in between the dates of 01-07-2019 to 26-07-2019. Tier 2 Descriptive test will be conducted on 08-07-2019. Exam Pattern and Syllabus for SSC CHSL Exam 2019 recruitment of LDC, DEO, Junior Secretarial Assistant and Postal Assistant/Sorting Assistant complete information is given below. Selection for this Staff Selection Commission vacancies recruitment will be conducted in 3 tier stage. Tier 1 Online written exam will be conducted for 200 marks and contains 100 questions with the time duration of 75 Minutes. Each question Carries 21 Marks. There is 0.50 Negative mark for each wrong answer. 23. Social Intelligence and Numerical operations. 4. Geometry: Elementary geometric figures, Triangle, Congruence and similarity of triangles, Circle and tangents. Questions will be asked from the daily changes in society, environment, politics, sports, awards, history, Indian Constitution, Budget, Economics, Culture, Geography, Science, research, countries and capitals, recently formed states etc..
CHSL Tier 2 Exam will be in descriptive mode of Pen and Paper for 100 marks with one hour duration. This paper for knowing the candidates writing skills and it is considered for preparing Merit List. Tier II qualifications marks is 33. Candidate have to write the exam in Either Hindi or English Language only. Tier 3 Skill test or Typing test only for qualification purpose only. Tier 3 test marks will not be considered for preparing merit list but the candidate must have pass the typing or skill test. Skill test will be conducted on computer and 15 minutes time will be given for typing the printed matter in English with Data Entry Speed of 8000 Key Depressions Per hour on computer. Typing speed in English is 35 wpm (10500 key depressions per hour) and in Hindi 30 words per minute (9000 key depressions per hour). Duration of typing test is 10 minutes only. Candidates have to type the given text message within 10 minutes only with respective wpm. 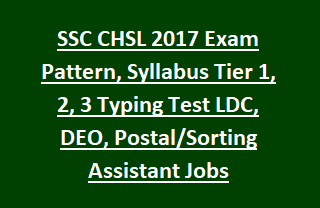 This is all about SSC CHSL Exam Pattern and Syllabus for LDC, DEO, Court Clerk and Postal Assistant/Sorting Assistant Jobs recruitment 2019. Does, Candidate required physical passing certificate of typing, for appearing for typing test ? Hi For SSC CHSL they didnt ask for any physical certificate.. for details u can refer official advertisement..
produce the relevant Certificate in Original such as Mark sheets, Provisional Certificate, etc"